A stroke, differently known as "brain attack" happens when a blood vessel that brings oxygen and nutrients to the brain either bursts (hemorrhagic stroke) or is clogged by a blood clot or some other mass (ischemic stroke). 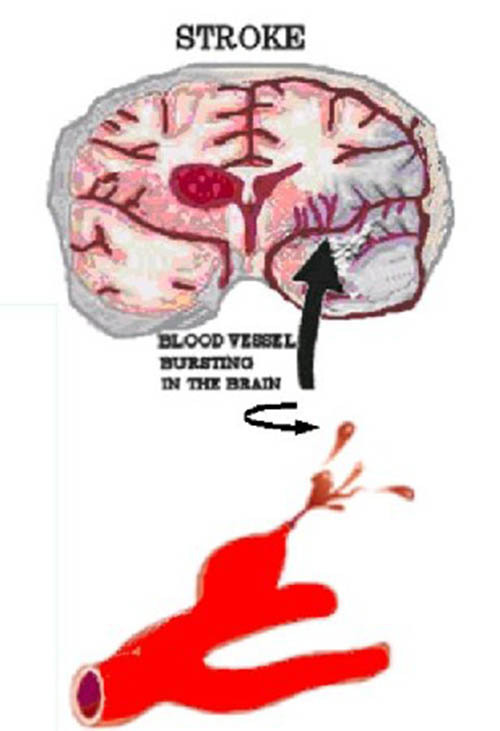 These two occurrences interrupt blood oxygen flow to an area of the brain, depriving brain cells of oxygen and thus leading to their death and further on to brain damage. The devastating effects of a severe stroke are often permanent because dead brain cells can't be replaced. Death of brain cells that occur during a stroke leads to loss of the abilities controlled by the area of the brain hit. These abilities include speech, movement and memory that have a high impact on the quality of the every day's activities. The extent of damage depends on the area of the brain affected as well as on how much the brain was damaged. Those people who suffer a small stroke will experience minor problems such as weakness of an arm or leg while those who suffered larger strokes may get paralyzed on one side or even lose their ability to speak. While some people may recover from strokes completely, the truth is that 2/3 of survivors will have some type of disability. Stroke is the number two cause of death worldwide and may soon become the leading cause of death worldwide. Today, there are treatments that, if given early, can reduce stroke severity. This is why it is important to know stroke symptoms, so you as well as doctors can act swiftly. 80% of all strokes are preventable! It is possible to prevent a stroke! In order to prevent stroke, you need to know if you belong to the risk group. It is important to state that not only elderly suffer strokes but also children and young adults who lead sedentary lives, eat junk food, smoke and drink alcohol. High blood pressure is the most important modifiable risk factor of stroke. How to lower your risks of stroke? Eat a variety of foods - choose, prepare, and eat foods low in fats, saturated fatty acids, and cholesterol. Exercise regularly - exercise may make the heart stronger and improve circulation. It also helps control weight. Being overweight increases the chance of high blood pressure, atherosclerosis, heart disease, and adult-onset (type II) diabetes-all being stroke risk factors. Physical activities like brisk walking, cycling, swimming, and yard work lower the risk of both stroke and heart disease. Be realistic: Make one or two small changes every month and stick to them. Be adventurous: Expand your tastes and try a greater variety of foods. Be flexible: Balance what you eat and your physical activity over several days. Be sensible: Enjoy all foods; just don't overdo it. Be active: Walk the dog; don't just watch the dog walk! Exercise is one possible risk factor for stroke that can be controlled. Dr. Lars-Henrik Krarup, from Copenhagen University Hospital, and colleagues reviewed the medical records of 265 people with an average age of 68 who had a stroke and were able to walk on their own. The participants were interviewed about their exercise habits and the number of hours they were active during a one-week period. The study results showed that the top 25 percent of people who exercised the most were 2.5 times more likely to suffer A LESS SEVERE stroke compared with people who were in the bottom quarter of the group. The most active also had a better chance of long-term recovery. "Exercise is one possible risk factor for stroke that can be controlled. Staying fit doesn't have to be a scheduled regimen. For the people in this study, exercise included light housework, taking a walk outside, lawn care, gardening or participating in a sport,"
The study authors note that their results help cement previous research showing that higher intensities of exercise as well as limiting the use of alcohol reduce the risk of stroke (both blood clot or bleeding in the brain). In a 2003 study, researchers showed in case-controlled studies that moderate and high-intensity exercise will reduce the risk of stroke by 64%. See your doctor for a check-up if you haven’t exercised for a while. Choose a range of activities you enjoy - choose things like walking, dancing, swimming, cycling, tennis or golf. It doesn’t matter what you do as long as it makes you feel warm and slightly out of breath. Gardening and housework would do too. Start your new exercise program slowly, especially if you’re not used to physical activity. Increase the intensity and duration as you become fitter, gradually up to 30 minutes a day. Just 30 minutes of activity five days a week was shown to be enough to reduce your risk of stroke. You can do everything in one go or exercise a few times a day in 10-, 15- or 20- minute sessions. Both ways are effective. Exercise with a friend or join a team sport to add a fun social element to the activity but also to keep up your motivation if your enthusiasm begins to flag. Remember to warm up and cool down - to prevent muscle cramp and stiffness. It is advisable to start with a few minutes’ warm-up (stretching) and slow down gradually (with stretching again) at the end to let your heart rate return to normal. Try different activities from time to time to exercise different muscles as well as keep your mind alert. Contact a physiotherapist or gymnasium instructor for advice and information regarding appropriate exercise.